Did Australia Fire Its Entire Legislature After a 1975 Government Shutdown? - Truth or Fiction? After a lengthy federal shutdown in the United States in late 2018 and early 2019, a meme suggested that Australians did not tolerate similar behavior in 1975. 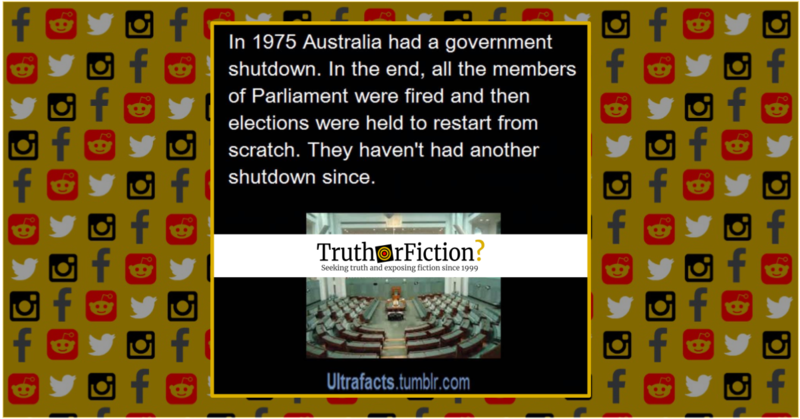 After the Australian government shut down in 1975, its citizens fired the government. In 1975 Australia had a government shutdown. In the end, all the members of Parliament were fired and then elections were held to restart from scratch. They haven’t had another shutdown since. 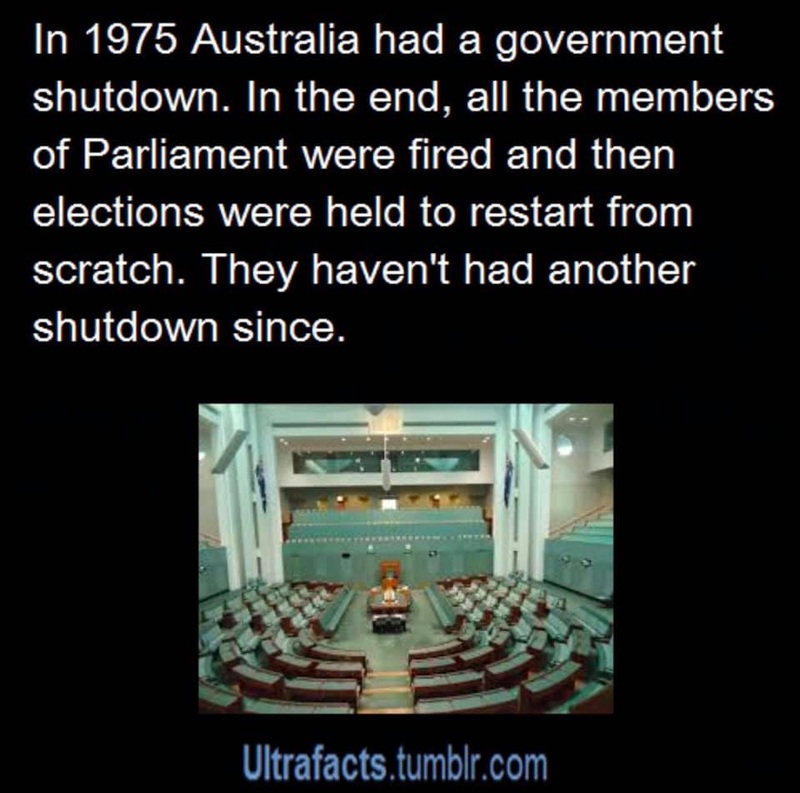 According to the meme, in the mid-1970s Australia’s government shut down under circumstances very similar to the 2018-2019 American shutdown (the latter over funding for President Donald Trump’s border wall initiative.) In response to that legislative gridlock, Australian citizens somehow “fired” their elected officials, arranged new elections, and started a completely re-staffed legislature “from scratch.” Owing in part to its format, the meme did not mention any mechanism whereby such a mass termination of elected officials could take place. Its sharer posted the image to Facebook with a comment, “I say it’s necessary [shrug emoji],” which added additional context to the meme. However, no immediate electoral remedy of the sort appeared to exist in the United States to replace the elected leaders of 50 states en masse and organize unscheduled elections. In the wake of Britain’s controversial “Brexit” vote, the United Kingdom gets a new prime minister [in July 2016]. But Theresa May, the U.K.’s former Home Secretary, will succeed David Cameron without ever being elected. Why? It turns out that it’s possible for someone to take the most powerful role in Britain without winning the public’s vote. The reason: Parliamentary democracy. Unlike the United States, which has a presidential system of democracy and directly elects officials, Britain elects a parliament once every five years. Each member of the British House of Commons belongs to a political party, and the party that wins the majority forms its own government and appoints a Prime Minister. A vote for an MP, or member of parliament, is a vote for a political party as much as an individual—and the party gets to name its own officials. That means that when a prime minister resigns or is removed during a non-general-election year, the ruling party selects its next prime minister, usually in a run-off election. To be sure, in addition to being a representative democracy, the United States is also a constitutional democracy, in which courts restrain in some measure the democratic will. At first glance, both Australia and the United States (US) appear to have similar systems of government. They are both federated nations meaning that the power to govern is shared between national and state governments. Both systems are bicameral, consisting of two chambers, with an elected House of Representatives and Senate. There are many similarities in the ways that laws are made. However, Australia is a constitutional monarchy and the US is a republic. The differences between the two systems can be seen in their overall structure and in the heads of state. As noted in that explainer, in the United States, Congressional elections are held every two years in November and always in an even-numbered year. In Australia, Federal elections are held at least every three years, or earlier if requested by the Prime Minister and approved by the Governor-General. Presumably, the events of 1975 involved the latter — one for which there appears to be no clear provision in the United States. But there actually is one foreign precedent: Australia did this once. In 1975, the Australian government shut down because the legislature had failed to fund it, deadlocked by a budgetary squabble. It looked a lot like the U.S. shutdown of today, or the 17 previous U.S. shutdowns. Australia’s 1975 shutdown ended pretty differently, though, than they do here in America. Queen Elizabeth II’s official representative in Australia, Governor General Sir John Kerr, simply dismissed the prime minister. He appointed a replacement, who immediately passed the spending bill to fund the government. Three hours later, Kerr dismissed the rest of Parliament. Then Australia held elections to restart from scratch. And they haven’t had another shutdown since. Australia, like the United States, has both a Senate and a House of Representatives. In 1975, the chambers were controlled by different parties. The House had passed an appropriations bill to fund the government, but the Senate refused to pass it because it believed that the government was spending too much money on unworthy programs during an economic downturn. The opposition party that controlled the Senate said it would not pass the spending bill unless the government met its somewhat outlandish demand. Does this all sound familiar so far? In the Australian case, though, the opposition’s demand wasn’t repeal of a health-care law — they wanted early elections, which they believed would unseat the ruling party. Prime Minister Gough Whitlam rejected the opposition’s demands but couldn’t bring the parties to a compromise, and the federal budget went unfunded. Then, on the morning of Nov. 11, Whitlam announced he would hold early elections not for the House but for half of the opposition-controlled Senate (typically, only one half of the Senate goes up for reelection at a time). Kerr, as the the official representative of the queen, who is technically still sovereign over Australia, summoned Whitlam to his office and fired him at 1:15 p.m.
A month later, Australia held national elections to replace the now-dissolved government. The opposition, led by Fraser, swept to victory in both houses. Australia has not had another shutdown since … You might find yourself wishing that the United States could follow Australia’s example: Fire everyone in Congress, hold snap elections next month and restart from scratch. But we can’t, because we haven’t recognized the British monarchy or had a London-appointed governor -general in more than two centuries. The Constitutional crisis of 1975, often referred to as ‘the Dismissal’ represents one of the most turbulent periods in modern Australian history. The ALP had been swept to victory in the 1972 Federal election and the Whitlam government was determined to implement a wide range of policy reforms. Despite successes in the areas of law reform, social policy, the arts, land rights and foreign policy, the Whitlam government was dogged by a series of scandals, the most serious of these being the ‘loans affair’ where the Government sought to secure finance without the consent of the Loan Council to fund projects during the lean economic period of the mid 1970s. In response to perceived mismanagement of the Australian economy by the Government, a Liberal party dominated Senate sought to block supply thereby freezing potential Government finances. The Liberals also demanded that an election be held for the House of Representatives or, failing this demand, that the present Government be dismissed. On 11 November 1975 Whitlam was dismissed as Prime Minister by Governor General Sir John Kerr, paving the way for a double dissolution and the end of the Whitlam era. The Dismissal was an event that polarised Australians, with many calling for changes to the system that removed a democratically elected government, yet today it is still possible for a Governor General to dismiss a Federal Government. The government of Australia became deadlocked over spending, and the impasse led to intervention by which then-Governor General Sir John Kerr dismissed the Prime Minister and dissolved the government. Subsequent elections replaced the government dissolved in the wake of the PM’s dismissal. But the events were controversial and those powers have not been invoked since, and no such mechanism exists in the United States. Australia had a government shutdown once. In the end, the queen fired everyone in Parliament. Did Rep. Alexandria Ocasio-Cortez’s State of the Union Outfit Cost Thousands of Dollars?